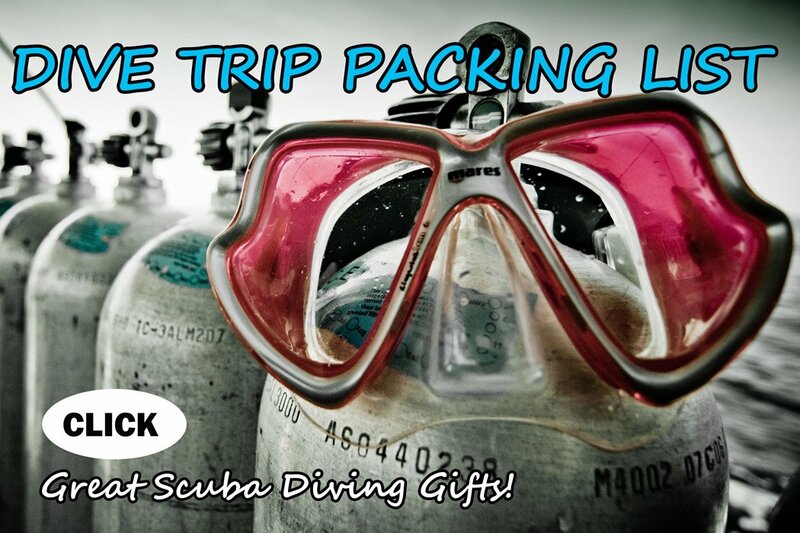 Diving on coral reefs in the crystal clear water of Kadidiri and diving on a WWII plane wreck. 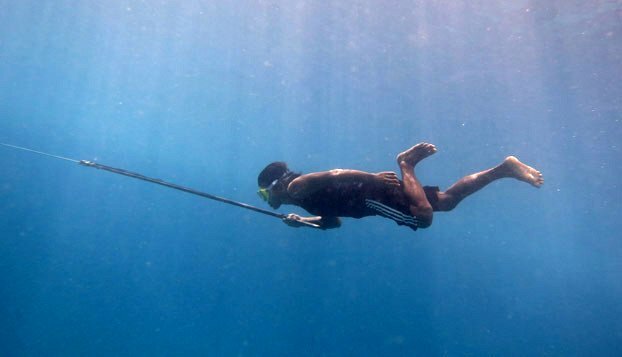 Spearfishing with the Bajau people “sea gypsies”. Staying in Pulau Papan and using traditional equipment. Swimming in Mariona Lake, a jelly fish lake, where millions of these creatures lost the ability to sting. My dive buddy doing a safety stop in the crystal clear water of The Togean islands. I traveled north overland through the massive island of Sulawesi, diving in the south, center and north. After diving at Pantai Bira in the south I traveled to Rantepau in Tana Touraja, central Sulawesi. The area is known for the very elaborate funeral ceremonies that goes with mass animal slaughter. The cave graves, hanging graves and high altitude coffee plantations were also very interesting. 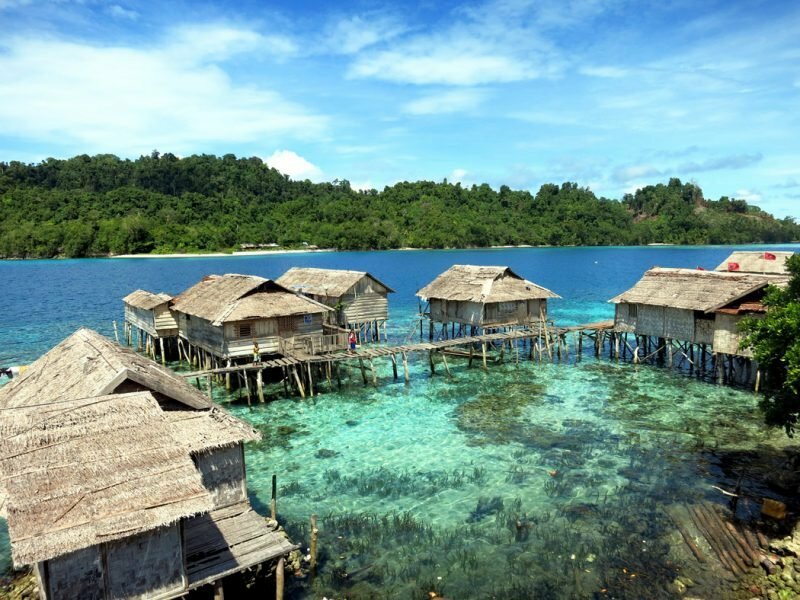 My next diving destination were The Togean Islands, a group of small islands close to Central Sulawesi. 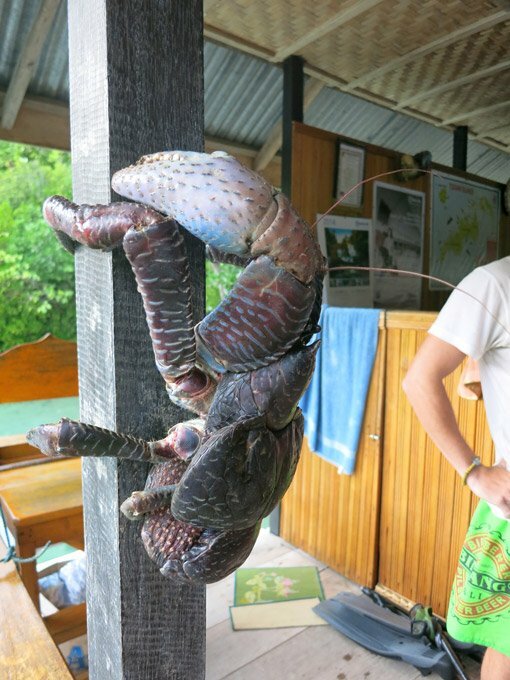 A big coconut crab, these guys often climb the palm trees. It is a species of terrestrial hermit crab and is the largest land-living arthropod in the world, it grows up to 4kg and 1m in length! Where are The Togean Islands? The Togean Islands is an archipelago of 56 islands and islets off the coast of Central Sulawesi. The islands are known for clear water, white sand and rain forests. Humidity is high due to the proximity to the equator. We had some unreal adventures around The Togean Islands. Staying in a village of the Bajua people, also known as “sea gypsies” as seen on the show HUMAN PLANET. Staying with the indigenous Bajua people they took us spearfishing using traditional gear. Swimming in a ‘Jelly fish lake’ was amazing. In this rare lake where jelly fish lost the ability to sting over millions of years of geographic isolation. Diving on the coral reefs and a plane wreck was interesting. I was hoping to see a dugong, but unfortunately we did not run into one of these saltwater manatees. Sulawesi is only one of about 17 000 islands that form this incredible country, there is no end to the spectacular nature and awesome adventures in Indonesia! 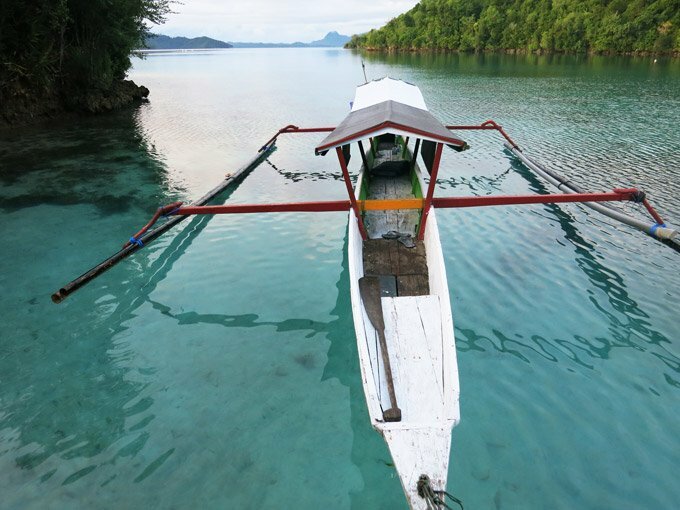 Getting to Kadidiri in the Togean Islands. 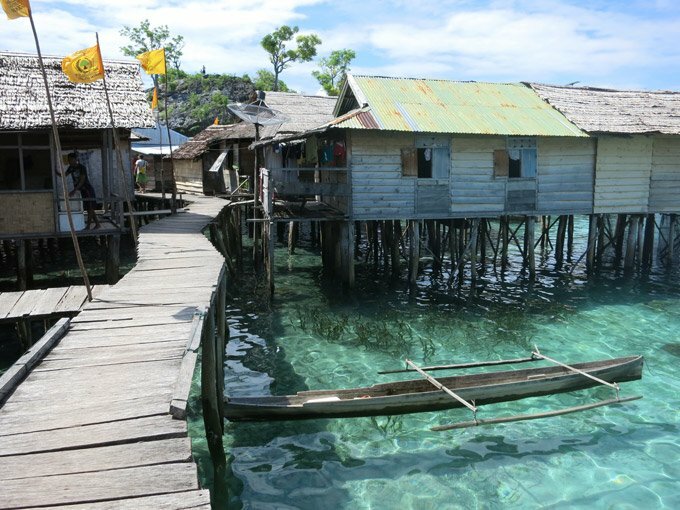 Kadidiri is one of the Togean islands in Central Sulawesi, you can only get there by boat. From South Sulawesi you have to take a ferry from Ampana, Getting to Kadidiri was an adventure on it’s own and took about 3 days. During this journey I missed the first bus and spent more than an hour on the back of a scooter with my backpack and diving gear to catch the bus! When traveling by boat taxi between the smaller islands choosing a good dry bag is a good idea to keep electronics from getting wet! 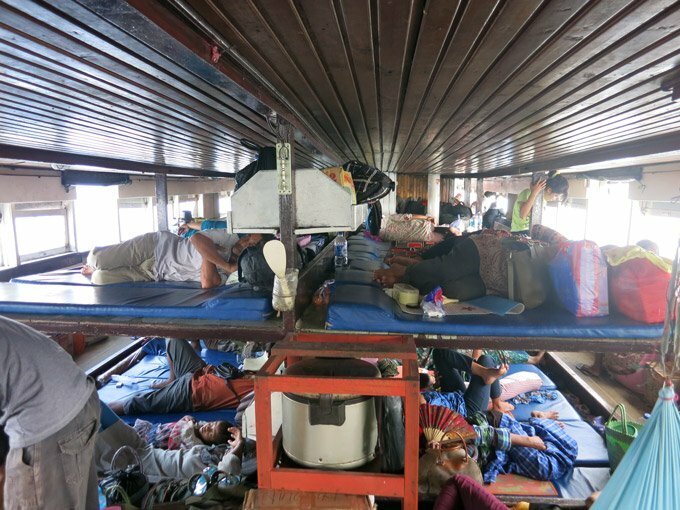 A bus from Rantepao to Poso, taxi Poso to Ampana, a local ferry Ampana to Wakai, free Black marlin boat Wakai to Kandidiri. To go to Mariona Lake and Pulao Papan just ask the staff at Black Marlin they helped us to find a local skipper to take us. Diving around Kadidiri was good with beautiful coral reefs. Marine life was small crabs, shrimps, cuttlefish and all the normal inhabitants such as clown fish, lionfish, moray eels and turtles found in these parts. We also saw some very interesting nudibranches. The water was very warm, my computer showed me temperatures up to 31C. The visibility was excellent at about 25-30 meters. Conditions were amazing and the reefs beautiful but unfortunately the macro life and pelagic species that I saw on my dives were not really unique. Diving on the wreck of a B24 Bomber plane about an hour boat ride from Kadidiri was an interesting dive. 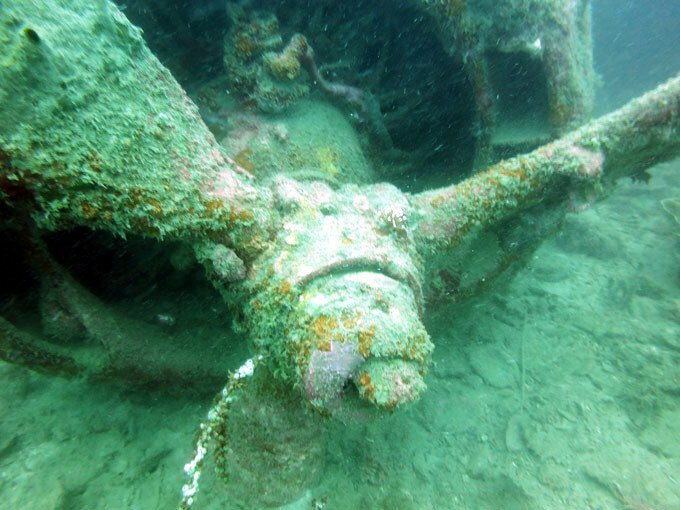 The plane was part of an American bomb squadron that crash landed during WWII. The B42 Bomber wreck from WWII was an interesting dive. Visibility around the plane wreck was less than 10 meters. We could penetrate the main cabin and there were fish, nudis and soft corals around the wreck. I had a great time here, but would not recommend a far, expensive trip here only for Scuba diving. I would rather go to Lembeh, Komodo or Raja Ampat. The highlight of my Togian adventure was the 3 day trip to the Bajuau settlement, Pulao Papan. These people are known as the “sea gypsies” of Malaysia and Indonesia. They live in houses on stilts built in the ocean and grow up, live and die in the sea. Togean Islands Arriving at Pulau Papan after a long drive by local boat. 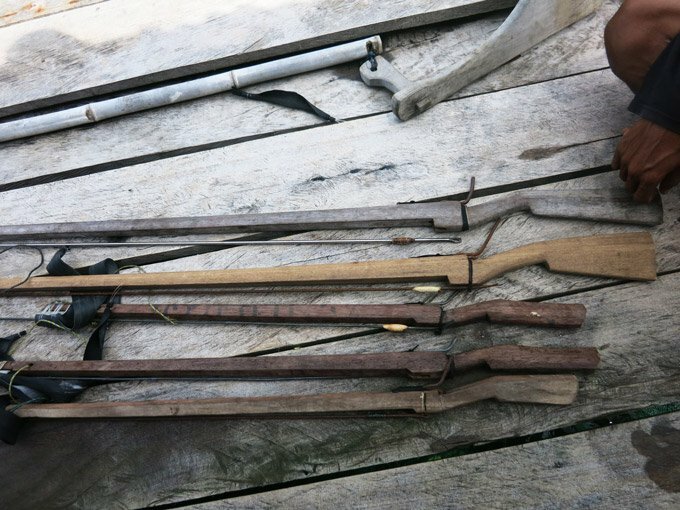 They go spearfishing in the traditional way; barefoot using goggles made of wood and a homemade spear gun. According to The BBC they can hunt on a single breath for up to 5 minutes. Together with two friends, David and Evan we paid a local skipper/fisherman to take us to Pulao Papan a Bajua settlement a couple of hours away. We also went to Mariona Lake, a jellyfish lake on the way. In this lake the dense population of thousands of Jelly fish lost the ability to sting humans. Swimming with thousands of harmless jellies was beautiful and an unreal experience. Swimming between thousands of harmless jelly fish was an unreal experience! At Pulao Papan our skipper organized for us to stay in one of the stilt houses with a local family. We were celebrities in town. The kids are not used to Europeans and walking around the village we always had a big entourage of local kids following us. Some of the local fisherman were fishing by doing ‘compressor diving’. 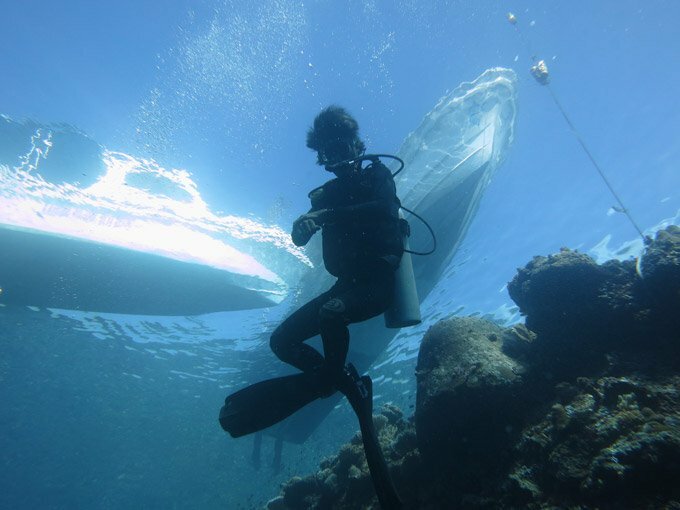 They dive with a surface supply of air coming from a compressor on a boat and lay out a huge net on the sea bottom. While diving they chase all the fish on the reef into the net and pull the net into the boat. This is very dangerous mainly because of the risk of decompression sickness and is also shown in the episode of ‘The Human Planet’ that I mentioned earlier. The toilet in the house we stayed in, we went diving in front of the house! We were invited to join them for a compressor dive fishing trip early in the morning. This is not an environmentally friendly fishing practice at all. We declined the invite and rather went spearfishing with their local champion. Using the wood goggles was difficult. I expected not being able to equalize the pressure in the goggles to be a problem. 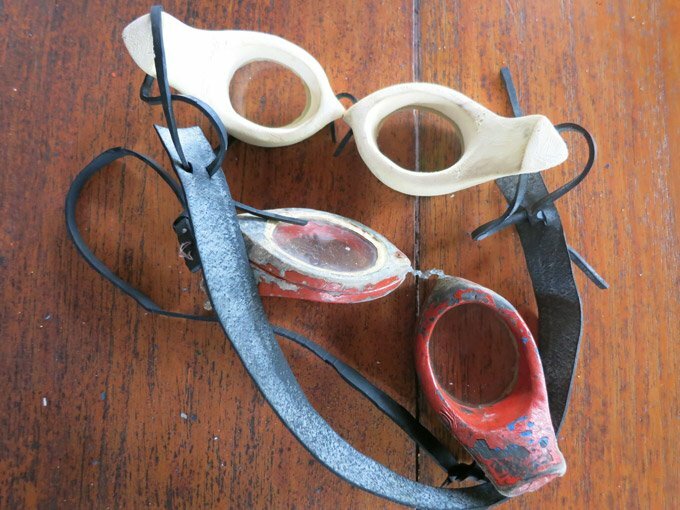 Water however leaked into the goggles eliminating the pressure problem. The goggles filled with water made seeing a problem. We still had little air pockets left in the goggles through which you could see a little bit. Wearing no fins with a gun in one hand made it difficult to dive deep. I managed to dive to 17m, but I could definitely not walk around on the bottom like Sulbin on the tv show! Evan managing a decent dive wearing only local gear. Diving with the local home made guns, these spearos are limited to target smaller fish. The guns are just not strong enough to shoot bigger game fish. The guns are powered by a couple of rubbers cut from car inner tubes. To increase the distance they can shoot, some of the guns are very big with barrels up to 2m long. Due to equipment limitations only small fish were shot in shallow water. I did not shoot a lot of fish, since I was not keen to shoot small reef fish. The local champion hunting the traditional way. There were a couple of nice size blue fin trevally hunting in the shallows. These game fish were however very skittish when we got in the water. Approaching them with stealth was not very successful without wearing fins. We could thus never get close enough to spear them. We stayed in the village the first night and on a close by island the second. We ate mainly rice and noodles like on any of the fairly isolated islands, supplemented by some of our fish. Mariona Lake and Pulao Papan were magic and is a bit of a mission to get to. Experiencing these place is definitely worth the effort if you travel to the north of Sulawesi. South Sulawesi. – Not well known as the north, but Pantai Bira has a lot of potential. We did some nice dives in the area. North Sulawesi. 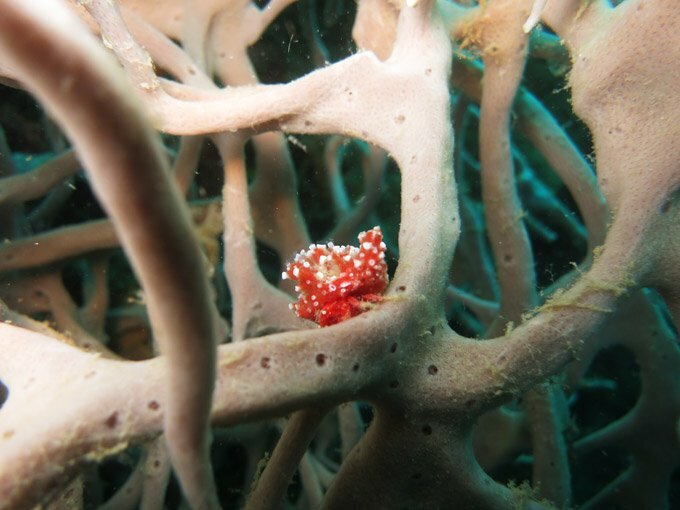 – Diving the famous walls of Bunaken and the magical creatres of Lembeh Strait. One look at our photos and you will understand why this place is a photographer’s dream! Hello Stingy Nomads, nice story..
Plan to visit Togean on July. I am a spearo and I wonder whether spearfishing is allowable at the area, especially when i stayed on one of the diving resorts having my spearfishing equipment, which commonly banned spearfishing. It will be very helpfull of you could advise the skipper’s name and his mobile, as well as Bajau’s spearo at Pulau Papan so i can manage to met the them for a spearfishing trip. Hello Sara, sorry for replying so late, we were hiking in Spain. 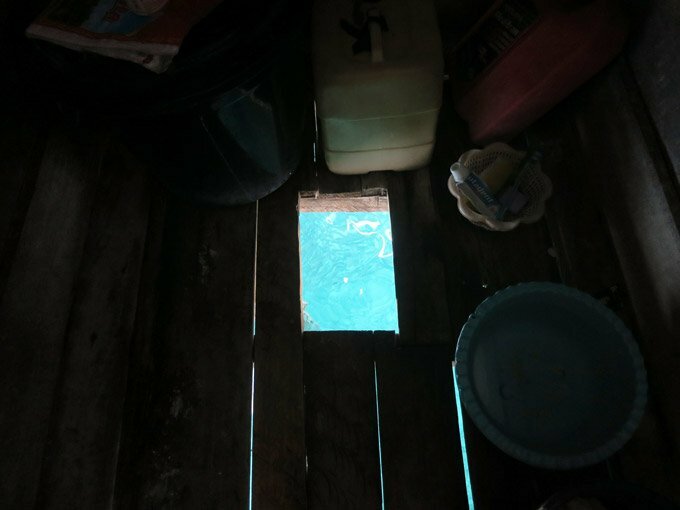 We stayed with Black Marlin lodge in Kadidiri, they helped us to contact a local boat, the skipper knew families in Pulau Papan and dropped us off at the house of a local family, we paid them something for staying the night (we slept on the floor). I think the Malenge Indah bungalows were nearby.